There’s been, and may continue to be, some radio silence from me for a little bit, but don’t let that fool you. It’s been a busy few weeks of emails and emails and pictures and THE MOST EXCITING CLOCK and wood glue and some Brasso. The wood glue? That cuckoo clock I was working on did not stay glued together long. 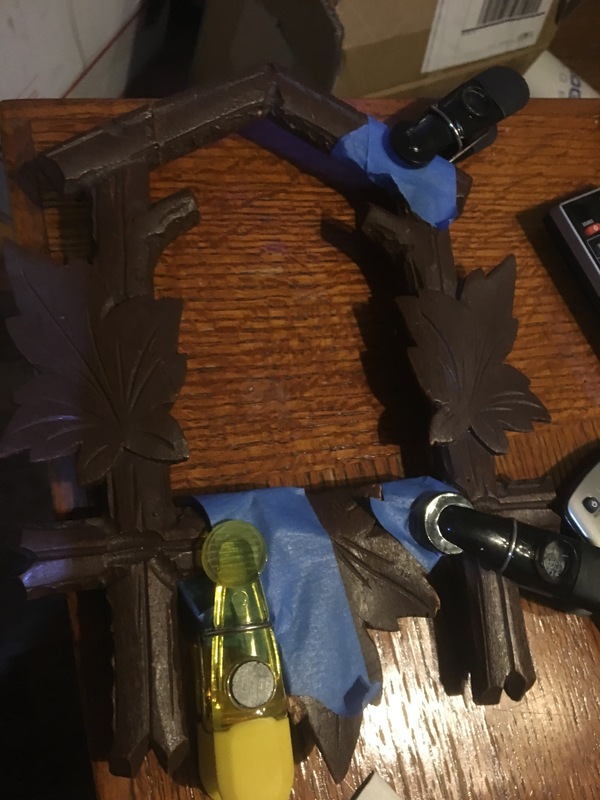 I’ve claimed some cheap clamps as my own and have reglued the pieces together in hopes that this time they hold. If this doesn’t work, next up is some small nails. Even glued well, it’s obvious to the naked eye that it’s a repair job, so I don’t want to waste too much time on it. It is how it is. The clock is ticking away though! I had mentioned last time that since I don’t have a proper testing stand I needed the clock to be inside the case to test it. 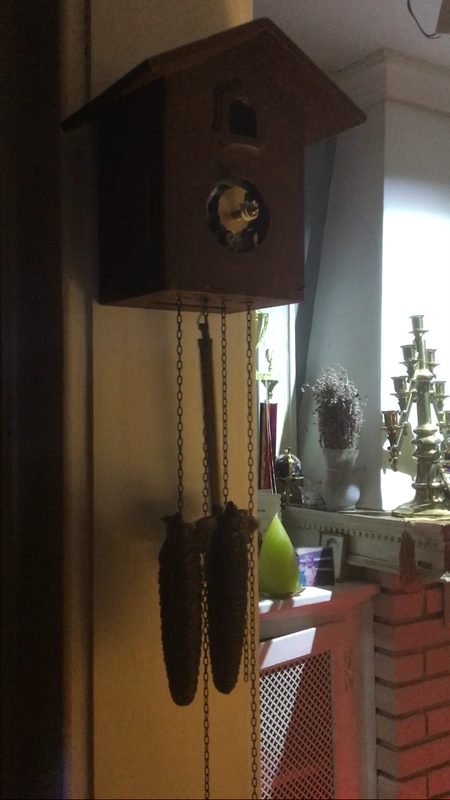 I was hoping to do so with fixed decorative leaves attached but since that was held up I went ahead and put the movement back in the bare case and hung it on the wall. 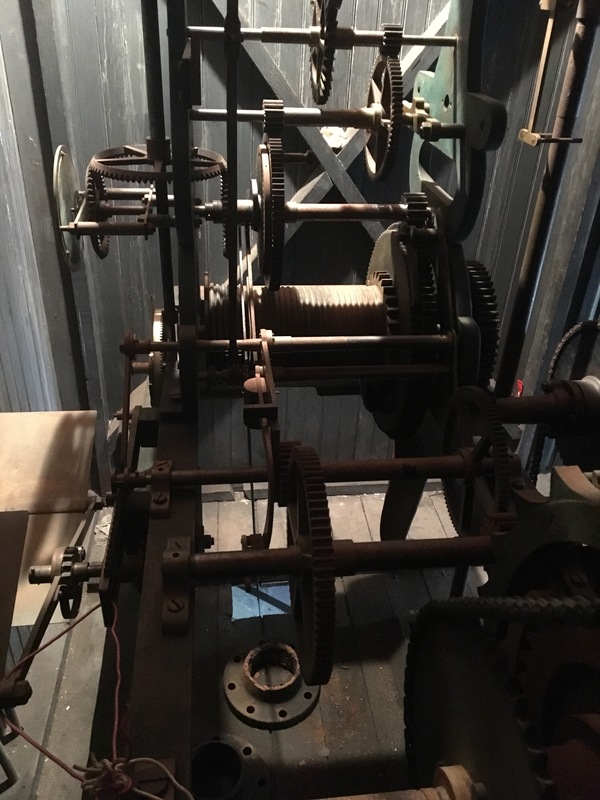 There were a few tense moments there when it wouldn’t run at first, but a few adjustments of the pendulum fixed that. Does it keep perfect time? I’ll have to wait until I make the new clock hands to check, but as for now I’m just glad it’s running at all. I got a new toy in the mail! It’s an Art Neauvou case stamped “J.B. Signifies the Best 110” which apparently is from the Jennings Brothers company. They existed in the early 20th century which matches the style of the case. 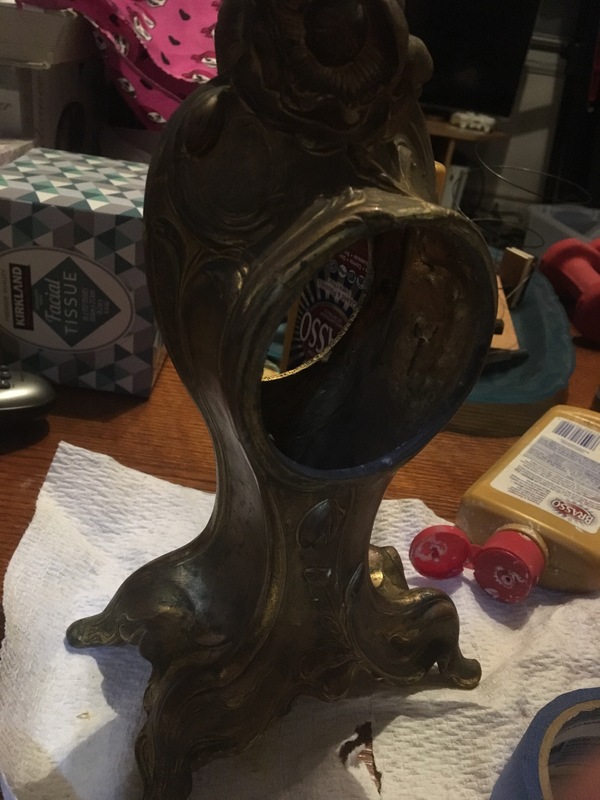 I was a tad hasty on the Brasso – the first few swipes cleaned it so well that I went full force, only to realize that I was stripping away some kind of gold-colored electroplating. The case seems to be copper (or at least that’s the color that was revealed) and has a brass coating on it. I switched over to the hot water and dish soap method of cleaning which is slow going so far but much safer for the case. 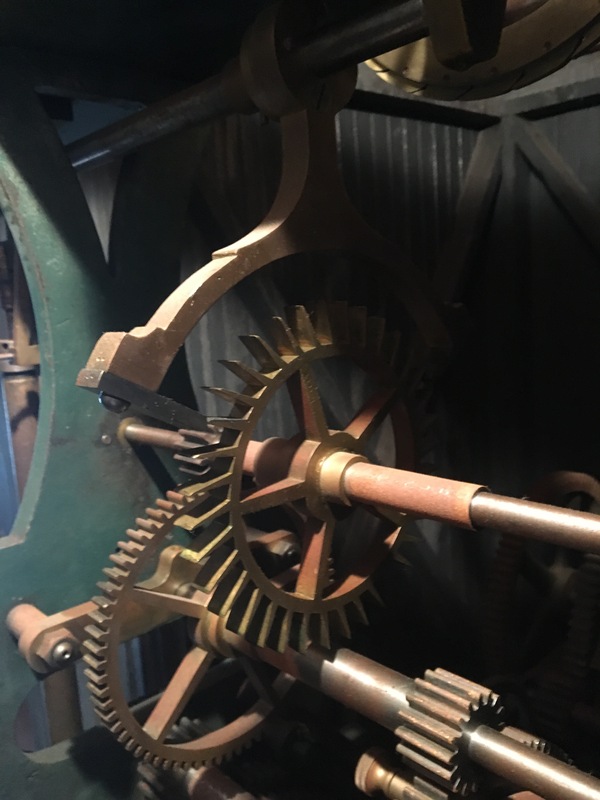 Oh wasn’t there something else to mention… hmm… oh yeah how maybe I finally got up close and personal with the town high school’s 1927 tower clock?! I don’t want to spoil any of the posts coming up, so for now I’ll say: 89 years old. E. Howard Clock Company Number 3 Striker. A/C motor driven… and in MUCH better condition than I anticipated. It was a joy to explore, and now I can’t get it out of my mind. I’ll do my best by it and research it as well as I can to present a full history to the high school and any locals who may be interested in the hidden piece of history up in that tower.